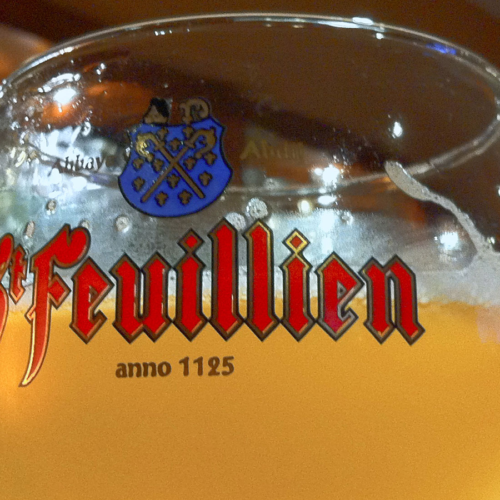 St. Feuillien is produced by a long line of passionate brewers, dating back to its 1873 founding by Stéphanie Friart, the Great-great-aunt of its current owners. The family holds tradition important, but also seeks to be innovative with new beers like their dry-hopped Grand Cru or Gluten-free Organic Grisette. The brewery draws its name and traditional brewing inspiration from the Saint-Feuillien Abbey that was founded in the town in 1125. Similar to Saison, Grisette was brewed for the working man to quench the thirst of a long day in the mines. A farmhouse style ale, pairs well with food and is easy drinking at 5.5% ABV. Grisette Blanche Bio belongs to the rich family of Belgian white beers. It is very refreshing in summer, but good with food any time of year. It is a full-bodied, savory beer offering lots of contrast. Its head is typical of wheaty beers – creamy and compact – with an opaque, hazy appearance. Respecting traditional methods, Grisette Blanche, in the bottle, is now certified organic.